YOU can take the man out of the robot but, it seems, you cannot take the robot out of the man. 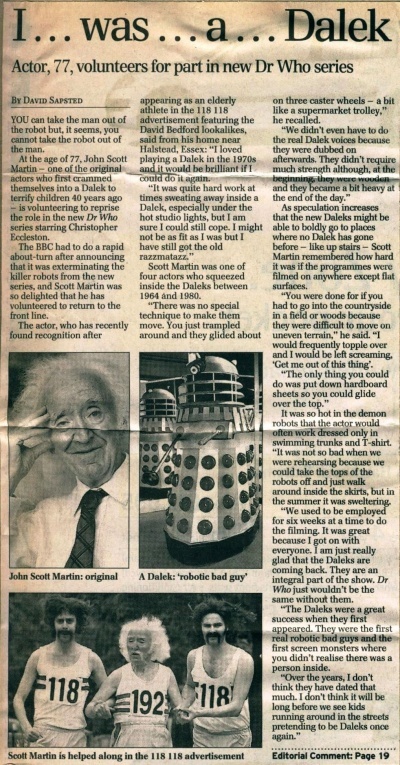 At the age of 77, John Scott Martin — one of the original actors who first crammed themselves into a Dalek to terrify children 40 years ago — is volunteering to reprise the role in the new Dr Who series starring Christopher Eccleston. The BBC had to do a rapid about-turn after announcing that it was exterminating the killer robots from the new series, and Scott Martin was so delighted that he has volunteered to return to the front line. The actor, who has recently found recognition after appearing as an elderly athlete in the 118 118 advertisement featuring the David Bedford lookalikes, said from his home near Halstead, Essex: "I loved playing a Dalek in the 1970s and it would be brilliant if I could do it again. "It was quite hard work at times sweating away inside a Dalek, especially under the hot studio lights, but I am sure I could still cope. I might not be as fit as I was but I have still got the old razzmatazz." Scott Martin was one of four actors who squeezed inside the Daleks between 1964 and 1980. "There was no special technique to make them move. You just trampled around and they glided about on three caster wheels — a bit like a supermarket trolley," he recalled. "We didn't even have to do the real Dalek voices because they were dubbed on afterwards. They didn't require much strength although, at the beginning, they were very wooden, and they became a bit heavy at the end of the day." As speculation increases that the new Daleks might be able to boldly go to places where no Dalek has gone before — like up stairs — Scott Martin remembered how hard it was if the programmes were filmed on anywhere except flat surfaces. "You were done for if you had to go into the countryside in a field or woods because they were difficult to move on uneven terrain," he said. "I would frequently topple over and I would be left screaming, 'Get me out of this thing'. "The only thing you could do was put down hardboard sheets so you could glide over the top." It was so hot in the demon robots that the actor would often work dressed only in swimming trunks and T-shirt. "It was not so bad when we were rehearsing because we could take the tops of the robots off and just walk around inside the skirts, but in the summer it was sweltering. "We used to be employed for six weeks at a time to do the filming. It was great because I got on with everyone. I am just really glad that the Daleks are coming back. They are an integral part of the show. Dr Who just wouldn't be the same without them. "The Daleks were a great success when they first appeared. They were the first real robotic bad guys and the first screen monsters where you didn't realise there was a person inside. "Over the years, I don't think they have dated that much. I don't think it will be long before we see kids running around in the streets pretending to be Daleks once again." APA 6th ed. : Sapsted, David (2004-08-10). I ... was ... a ... Dalek. The Daily Telegraph . MLA 7th ed. : Sapsted, David. "I ... was ... a ... Dalek." The Daily Telegraph [add city] 2004-08-10. Print. Turabian: Sapsted, David. "I ... was ... a ... Dalek." The Daily Telegraph, 2004-08-10, section, edition. This page was last modified on 23 July 2016, at 02:44.